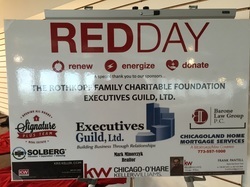 On May 12, 2016, over 200 volunteers came out to celebrate RED Day, an initiative dedicated to celebrating Keller Williams Realty’s ear-round commitment to improving our local communities. Each year, on the second Thursday in May, tens of thousands of associates from across the United States and Canada participate in a wide range of projects, devoting their time to renewing and energizing aspects of the neighborhoods in which they serve. This year Keller William's Chicago O'Hare hosted a meal packaging event. Together they packed 50,000 nutritious meals of Macaroni and Cheese that were donated to the Chicago Food Depository. These meals were distributed to Chicago area food insecure households.